By David SirotaAccording to oddsmakers, Steven Spielberg’s “Lincoln” does not have the best chance of winning the 2013 Academy Award for best picture. That top spot right now goes to Ben Affleck’s “Argo”—but it shouldn’t. If history is any gauge, “Lincoln” has to be the front-runner thanks to its status as this year’s only Oscar-nominated White Savior film. If you’ve been to the movies in the last half-century, you know the White Savior genre well. It’s the catalog of films that features white people single-handedly rescuing people of color from their plight. These story lines insinuate that people of color have no ability to rescue themselves. This both makes white audiences feel good about themselves by portraying them as benevolent messiahs (rather than hegemonic conquerors), and also depicts people of color as helpless weaklings—all while wrapping such tripe in the cinematic argot of liberation. Coming from Spielberg, this isn’t particularly surprising. He is, after all, the creator of one of the most unself-consciously archetypal White Savior movies of all time: “Indiana Jones and the Temple of Doom.” In that cartoonish adventure, a whip-wielding white archaeologist drops from the sky into India and quickly becomes the only person able to save destitute peasants from the rein of a tyrannical human-sacrificing cult. Spielberg’s Abraham Lincoln is certainly a more nuanced character than Dr. Jones, just as his latest film is more sophisticated (if not as exciting) than the second iteration of his 1980s archaeologist-superhero franchise. In return, he has been rewarded with an Oscar nomination—but probably not just because “Lincoln” plays to the academy’s general love of historical drama. It also plays to Hollywood award organizations’ specific affinity for the White Savior. 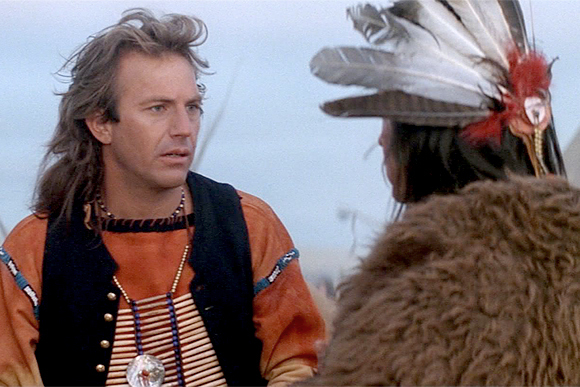 One of the major sub-categories of the White Savior genre is the “going native” narrative, and 1990′s “Dances With Wolves” is the modern era’s emblematic example. It is the story of a white Union soldier who fully embeds himself in the Sioux tribe and quickly becomes its primary protector. First, he leads the tribe’s defense against its hostile Pawnee rivals, then he helps them attempt to evade the Union army in which he once served. Because it portrays a few people of color in a positive light, the use of the Noble Savage caricature often preemptively blunts criticism of the underlying White Savior story. The idea is that a film like “Dances With Wolves” cannot be bigoted or overly white-centric if it at least shows Kicking Bird and Chief Ten Bears as special and exceptional. This, even though the whole story is about a white guy who saves the day. “Avatar” is such a stereotypical White Savior flick that it earned the nickname “Dances With Aliens.” That label is well deserved, as the film offers up almost every lazy meme in the genre. Tribe of nature-loving Noble Savages? Check. White spy who “goes native” with said tribe? Check. Spy has an enlightened epiphany and a subsequent change of heart, aligning him with the tribe against their evil enemies? Check. White guy unifies disparate tribes to fight their collective oppressors in a more powerful way than they ever have? Check. But it goes even deeper than that. As The Progressive magazine put it:Jake Sully, played by Sam Worthington, is the white hero who enters the Na’vi’s land, learns, in three months, all their secrets, becomes a super-Na’vi and is able to return and save them from the attack of his crazy nation’s warmongers. Jake is Cameron’s version of Tarzan, the white man who will save the “savages.” Jake is the only one who can successfully pray to the Na’vi’s mother goddess (Eywa). She hears him, not her own people’s prayers and grief.Comment: For more on the subject, see Cameron Defends Avatar's White Messiah and The White Messiah Fable. Yeah, this isn't just Hollywood. It's throughout pop culture. You can see it at its worst in the old pulp magazines. The biggest Avatar wackiness I've seen is "Na'vikin". Like "otherkin" (people who think they're elves or dragons) but with ten-foot blue aliens. Some of them even petitioned the government for a federally recognized tribe. Kinda hard to notice anything else after that. Well, that and anyone who said it's an original storyline, as if noble savages don't date back to Gilgamesh.